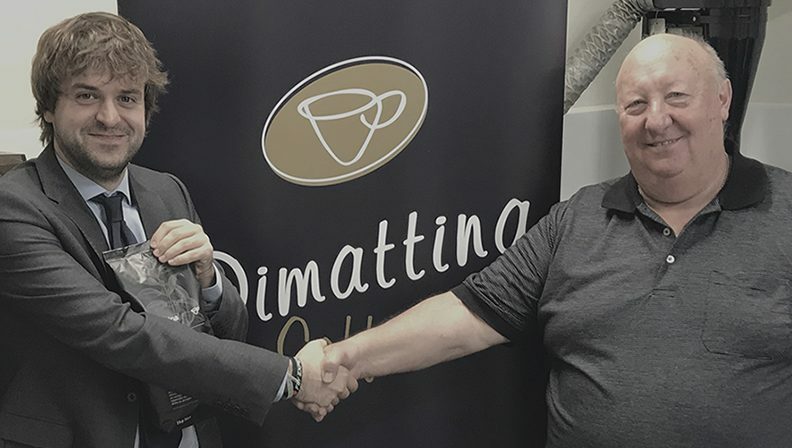 Melbourne roaster Dimattina Coffee has installed a Goglio vertical form fill seal (VFFS) machine, giving the company an edge in the competitive wholesale coffee roasting market. Since 1954, Dimattina Coffee has established itself as one of Australia’s leading purveyors of exclusive, specialty blends and roasts. An increase in output by 24 1kilo bags per minute on top of their current operations. Photo: Federico De Paoli – Product Manager/Machine Division for Goglio visiting Dimattina Coffee in Melbourne. The installation of Goglio’s G21 vertical form fill seal (VFFS) machine marks the Melbourne roasters’ newest packing machine, to service their fast growth alongside the café market. Dimattinas’ Lino Bettiol & Agim Tarevski purchased the G21 through Jet Technologies. What attracted Dimattina to the G21 were its proven operations in the Australian market, and the ability to purchase the machine, coffee laminates and degassing valves from a single source. The Goglio G21 is built specifically for coffee, it is the ideal solution in order to pack coffee in premium bags, allowing the medium to large sized coffee roasters to compete with multinational brands. The G21 machine for Dimattina packs coffee bag sizes of 1kg, increasing their output by 24 bags per minute. With Lino’s roasting expertise of over 30 years, Dimattina are always looking to improve their operations and plan ahead for the volume. Jet Technologies would like to congratulate Dimattina on the purchase of their new Goglio G21.